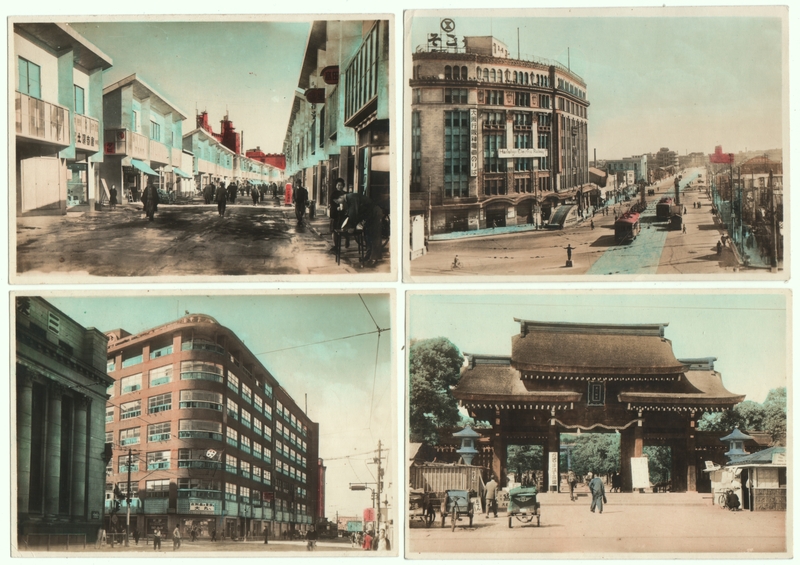 Four photos, each a bit more than 4.25 x 3 inches. Over a year of posting pictures of people, and not a single Asian person, as if half the world’s population didn’t exist in old photos. Shame on me, especially since I have followers in Asian countries. In my defense, antique photos of non-whites are typically rarer (at least in the U.S.) and therefore more expensive, so the rather slapdash style in which I initially assembled my collection, impulsively gobbling up bargains, left me with virtually no pictures of Asians except for some newer snapshots of mediocre quality. But I do have these. Even though they are commercially reproduced, probably part of a set of souvenir photos sold to tourists, they meet my (admittedly self-imposed) rules of being vintage photos showing people. Plus, I think they’re beautiful. Those colors! And so many fascinating details to look at. Note the guy in the upper right conducting traffic like he’s conducting an orchestra. I don’t know exactly where these photos are from. I had been assuming China, based on the gate in the lower right. But when I finally enlarged them for this post, I noticed the sign in English in the upper right for the Hanshin Electric Railway, and I realized it was Japan. (I’m operating under the assumption that these are all from the same country, at least.) Still, I don’t know what town or towns, so any help identifying these would be greatly appreciated. Meanwhile, my sister just married a guy in Japan, and my new nephew is half Japanese. Not to mention, the railway seems to exist in the southern part of Japan, vaguely the region where she now lives. So I’m delighted to think that these show Japan, because it lets me post them in celebration of her new life. I have found your Japanese counterpart! Here is the same Hanshin station and if you’re real curious, the owner of this site could probably identify the other pics for you. I have seen his pics linked to resource information. Wow, thanks for looking that up, and for the link! Great to get at least one photo location identified, since there’s a good chance they’re all Kobe. And it’s a fun website to look around. It’s probably also pretty necessary to look through vintage photos for identification of these sites, since between WWII and the 1995 quake, there’s probably very little of this still standing.